I am so excited about this post because the answers are all from you and they are all awesome! Really. I don't think I could come up with anything better than what was submitted, so I just want to put all the answers here on one page. The most exciting thing, in my opinion, is that the answers touched on all the multi-faceted parts of grace. 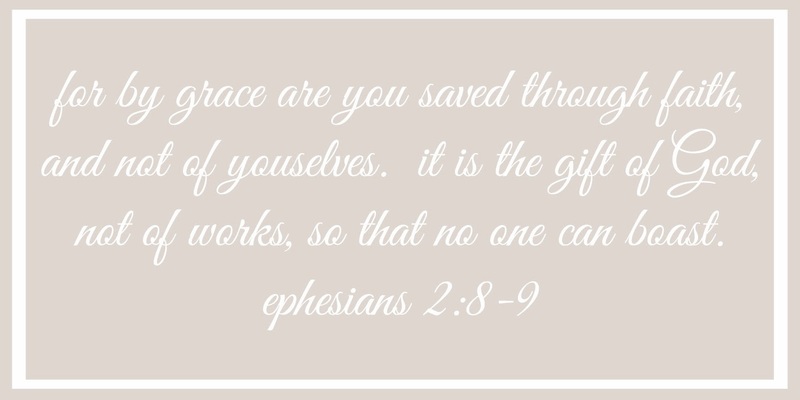 There is grace extended to us upon first receiving Christ as Savior, grace that sustains us during hard times, grace that welcomes us back with open arms after asking forgiveness, and on and on. And I think the answers provided touch each aspect of grace so well. Q: What is the opposite of grace? The opposite of grace is a sticker chart. Like when a child is being toilet trained, they get a sticker each time they go in the potty/toilet, and then get a reward at the end? They have to earn that reward; we cannot earn grace. This may sound odd, but I would venture to say that the opposite of grace is justice. Grace, like mercy, is the unmerited support and love that is bestowed on us regardless of whether or not we deserve it. Justice, on the other hand, means we are judged and treated fairly based on what our behavior shows we deserve. With one, we get what we deserve-- with the other, we get what we do not. 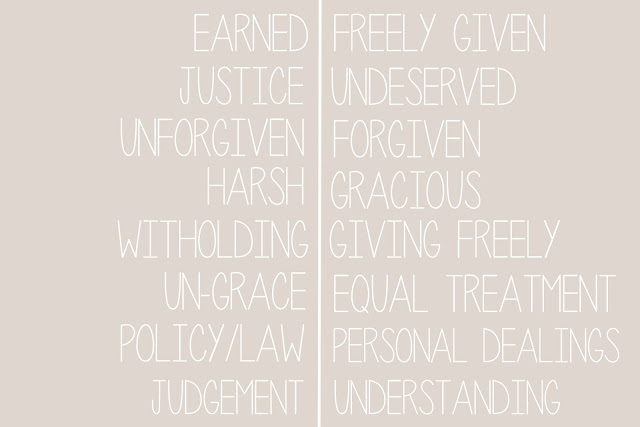 But I do not think either is bad (justice or grace) and I think our God is both. Which is all part of the unfathomable nature of Christ. Justice and grace in perfect combination. Great question! It was an interesting one to consider. 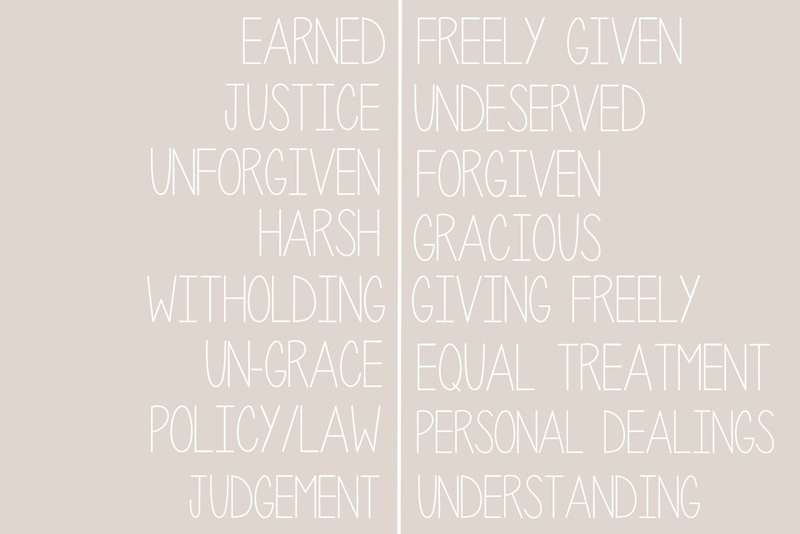 The opposite of grace is unforgiven. In order to forgive others, we must extend grace. The opposite of grace is harshness, or being ungracious. Gracious people are pretty much never regarded as harsh. I pondered your question: "What is the opposite of Grace?" Many ideas ran around in my head, and almost all of them were negative, but it hit me that it need NOT be necessarily negative. God gives abundantly, lavishes his love through the Christ and His offering on the cross and my life is more full and rich because of that Giving of Grace. On the opposite side, He WithHolds! and that withholding is Mercy. I deserve His Wrath, nothing I do can give me any favor in His sight and yet He still holds back...in fact because I am "In Christ", He gives. So for me, for now, the opposite of Grace in the context of my identity in Christ, is Mercy. Hallelujah! 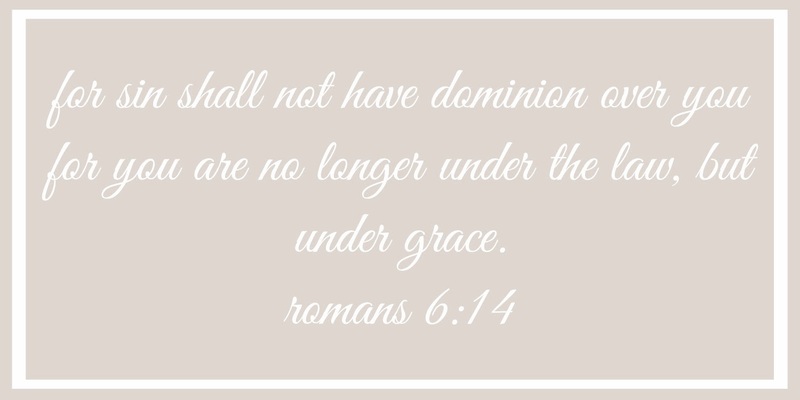 Un-grace? Treating a person only as well as he deserves to be treated, or perhaps only minimally better than he deserves to be treated. Policy? (Law?) Treating the other person in accordance with an impersonal calculation. The first thought that came to my mind is judgement. For me, I feel like I am making assumptions about people's intentions and therefore judging them, rather than showing grace. I would perhaps say the opposite is law - in that Biblically we move from Old Testament law (things to do and not do), and we move into grace - lines could be blurred here, compared to the law...ie (off the top of my head), the law would say not to work on a Sunday (holy Sabbath), but Jesus picked the wheat (wheat? I think it was that), and everyone got upset for His disregard of the laws of the Sabbath. Perhaps they were over zealous in their definitions of the laws given, or perhaps that is just the way of human nature. We always over react, don't we? We are too law-abiding and judge-y of those that don't meet our standards, or we are so lax and call it "freedom under grace to do as we please". And we miss God in it, because He's not there in those "laws". Truly, I thought all these answers were fantastic and hit on every aspect of grace. And maybe identifying the opposite of the ideal can help us more easily identify the sin aspects that so easily beset us. These answers were all so wonderful, thank you to everyone who participated! I loooove the graphic at the end. GREAT lists and wonderful reminders!! I was just reading 2 Timothy and this same question popped into my mind. I think it's so helpful to consider opposites for the exact reason you mentioned above. I was really excited to see someone asking the same question. 😀 I'm glad I stumbled across your blog, I have enjoyed what I've read!